In presenting the 2010 budget for the City of Paris, Mayor Bertrand Delanoe spoke of his desire to turn Paris into a true “eco-capital”. His commitment to sustainable development has earned the French capital second place among the European metropolises in the “green cities” classification. This is largely thanks to the proposed Climate Plan, which calls for a 25 percent increase in clean energy use by 2020. The mayor anticipated the revitalization of urban highways, such as the two roads running along the Seine River, which connect the western and eastern parts of the city. The riverfront will become a green pedestrian area with recreational space. Buildings will adopt renewable sources of energy, making the city’s architectural make-up more sustainable. One initiative is the École Maternelle, designed by Eva Samuel Architects and Associates. A year after Delanoe’s public commitment to making Paris a greener city, the school is the first to comply with the Climate Plan. Featuring sky windows, ventilation chimneys, solar screens and thermal bridges, the gray multi-form structure adopts Northern European design concepts. 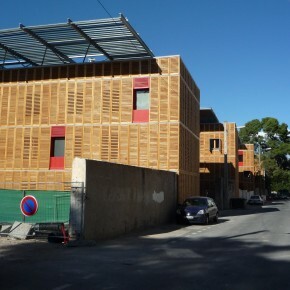 Marie-Hélène Contal, director of the French Architecture Institute in Paris, explained that sustainable planning and development stretches beyond Paris. The French are becoming environmentally conscious. Lyon, Bordeaux, Grenoble and Nantes have launched “eco-quartiers,” a mix of green energyeco-construction and housing typology—duplexes and triplexes with green houses on balconies, collective storage for bicycles, and access to rooftops from gardens. Key leaders include Françoise-Hélène Jourda, an awardwinning architect who is a Chevalier de l›Ordre de la Legion d’Honneur, and a Knight of the Order of Arts and Letters, and Philippe Madec, prominent architect and former scholar at Columbia University in New York City. “I admire first their courage in promoting sustainable architecture for the past 20 years, which has not been easy,” Contal says. “Their ability to combine innovative typology and eco-technologies without making the structures look too narcissistic has been impressive,” she adds. Altogether sixty architects in France are turning cities into green houses, following the example of other northern European metropolises. “The innovative wind blows from Germany and Austria, leaders in the new green housing technology,” remarks Contal, who is very much aware of the German influence in the form of “passive houses” that use wood rather than concrete as their medium. In the past, the mono-culture of concrete depressed urban centers. Luckily, both countries have succeeded in combining green-building industry development with architectural creativity, turning them into leaders of eco-construction. “However, the ecological and technical aspect of sustainable design is difficult to replicate in Southern France,” Contal adds. 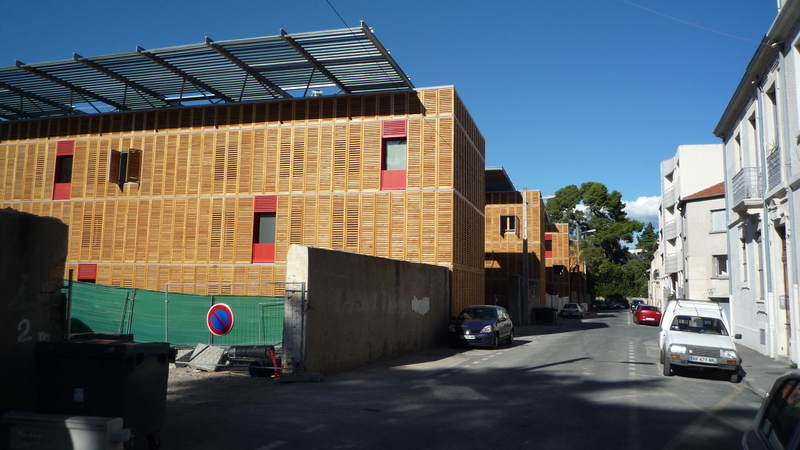 Modern cities of Marseille and Toulouse don’t worry about the rising price of heating. Buildings are isolated, and exposed to the sun. Insteadthey are concerned with global warming and the rising price of cooling. Old Mediterranean areas as Corsica and Provence, for example, keep heating costs down. The architecture utilizes large, thick, adjoined buildings, with “thermal inert” courtyards to provide cooling and shadow. Therefore, architects who are defending ecological approaches of natural ventilation, open courtyards, and the return of stone and brick have to fight the urban rules of the South. The relationship between green architecture and city planning is fairly new, and slowly growing. Whereas the German green movement began with a revolutionary construction industry, the French adopted citytransport policies in support of public space renovation. Decisions to demolish old districts and renovate housing, transport and public space did not always mesh with the French mentality of preserving national identity and cultural heritage. Jana Revedin, an architect working in Germany, Austria and Italy, and a professor teaching in Sweden shared a broader European perspective. She says: “Sustainable development also includes the political, social and cultural needs of society. It is the architect’s goal to work for equity, democracy and the appropriation of the public ground by the people.” She refers to the practice of civic engagement and the multidisciplinary approach of Northern Europe – Sweden, Norway, Denmark or Finland. Citizens are invited to take part in making decisions regarding urban planning. “We have to learn from the European North, where dialogue, discussion and compromise are the tools and no star-attitudes or arrogant design-despotism may nest,” Revedin says. Architects have to also learn from Southern Europe’s cultural aspect of sustainability, defined by innovative craftsmanship and finest detailing. Revedin remarks: “If we fulfill the simple everyday needs of men, our architecture necessarily becomes sustainable by being understood and accepted by the people…In this way beauty is a logical consequence, not a design conceit.” To conclude, what becomes aesthetically pleasing to the eyes of the society will be naturally protected and sustained.